When I woke up at 5:30 a.m. with the morning sun beaming on my face and the birds singing just outside my window, I just knew that this was going to be one of those perfectly beautiful spring days that makes a person walk around all day with a big smile spread across their face. Rich was already up and the smell of coffee wafted up the stairwell, bless his heart. By the time I stumbled downstairs he already had a cup prepared just the way I like it, heavy on the half-n-half, and waiting on the table beside my seat on the end of the sofa. Rich had spent the weekend rebuilding the deck steps and other general repair projects that he had on his list. Our old deck steps were too steep and getting very rickety. He created a new set which added one more step than before and are much more solid. All that remains to be done are the upright slats and a coat of paint. He also lowered a section of the main deck rail to create an unobstructed view of the alpaca pastures and add a table/bench. On warm summer nights we enjoy relaxing on our deck as we sip wine and watch the alpacas as they do their sundown pronking. This is an activity that has to be seen to be believed. It almost always occurs at sundown when it's just too dark to take pictures. Usually the younger ones, in our case the boys, begin chasing each other around and around the pasture, picking up speed until they are literally bouncing with all four feet in the air. The best way I can describe it is like the action of the cartoon skunk, Pepe LePew, for those of us who are old enough to remember him. Just check out the baby alpaca in this link. On Friday I received a text from our granddaughter, Olivia, who will graduate from high school in just over a week. She was just wondering what we were doing over the weekend. She and her friend, Kelly, wanted to come up and make strawberry jam with me. She must have been reading my mind because just coincidentally, I had purchased a large quantity of strawberries that were on sale at my local supermarket for just that purpose. Because of the mild winter that didn't completely kill off the weeds, our own strawberry patch has been overrun and Rich is going to replant the whole thing. So this year that means I have to get berries wherever I can buy them. 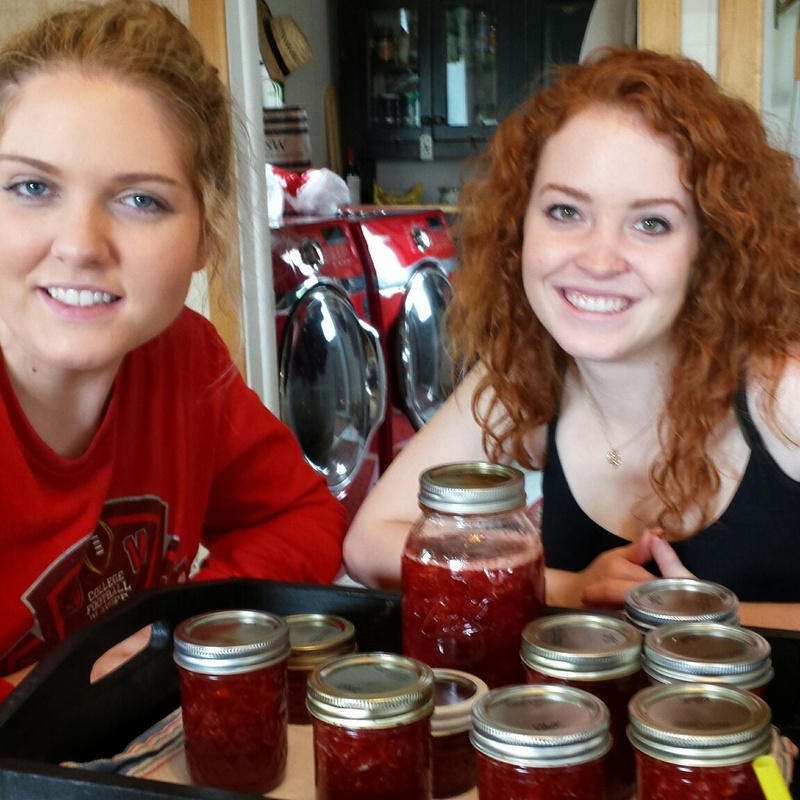 Olivia and Kelly came up for lunch on Saturday and we made jam in the afternoon. Olivia has made jam every year with me for so far back that we have both forgotten when the tradition began. She pretty much knows the procedure by heart. I just sat at the kitchen table and let the girls take over. It was so nice to have teenage girl laughter in the house again. Very reminiscent of the days when our own daughters were teenagers. Kelly and Olivia cleaned, cut up and measured out the berries. 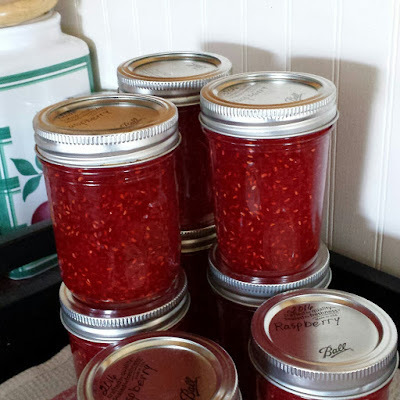 They added the touch of fresh lemon juice that I think helps keep the color and adds a note of brightness to the jam. With the sugar measured out and ready to go, they cooked and stirred until they had a lovely, bubbling pot of ruby red jam. Sugar added and stirred for another minute or so, they were ready to fill the jars. After the process was over they cleaned the mess up and, being contemporary young women, they had to take the requisite selfie with the product! The girls decided to stay overnight and go to dinner with us Saturday evening. We had a bit of time to kill before dinner and it was drizzling rain outside so we watched a Nicholas Sparks tearjerker movie together while Rich napped. Then we all met our friend, Steve, at Logan's Irish Pub for supper. I really cherish these moments with my grandchildren, Olivia, Max and Zaidee. As they become teenagers the time begins to fly by and I realize that all too soon your grandchildren are out on their own. As they begin to create their own life apart from the nuclear family they become busy and we see them less and less. It's so ironic that when we raise our children to become independent adults and push them out on their own, we will see less and less of them. Bittersweet. That's life. Because of the ideal weather conditions yesterday and today, there has been a hum of agricultural activity all up and down the road. Yesterday the person who farms the field across the road was tilling up the soil in the field in preparation for corn planting. He finished up his work at mid-night. I know this because our bedroom is on the front of the house and every time he approached the turn at the road side of the field I could hear the rumble of his approach and the headlights shone in the window. He began planting the corn early this morning and is just finishing up. This morning I also heard the unmistakable drone of a crop duster increasing and decreasing in volume as he made passes over a field beyond the southwest woods where they were spraying fertilizer. Those pilots have all the daring do of the old barnstorming pilots of the roaring twenties. I can't help but admire their skill. Here in the house I have been dying yarn in preparation for our first Seneca County Farmer's Market in Tiffin this upcoming Saturday. 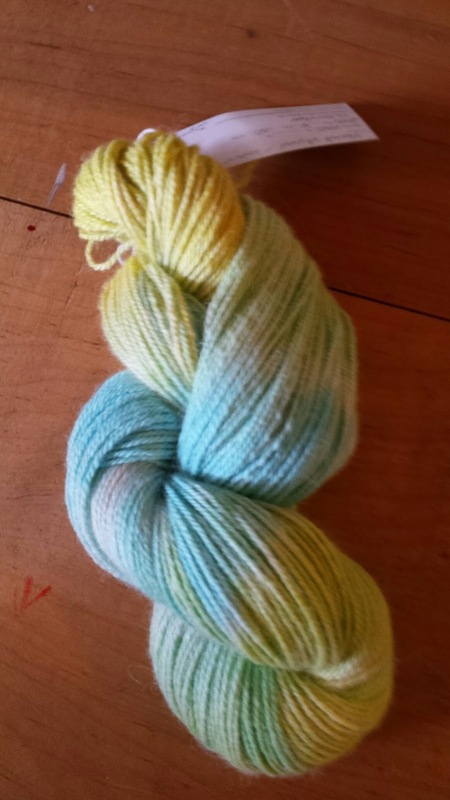 I have been experimenting with eco-friendly dyes during the latter half of the winter. 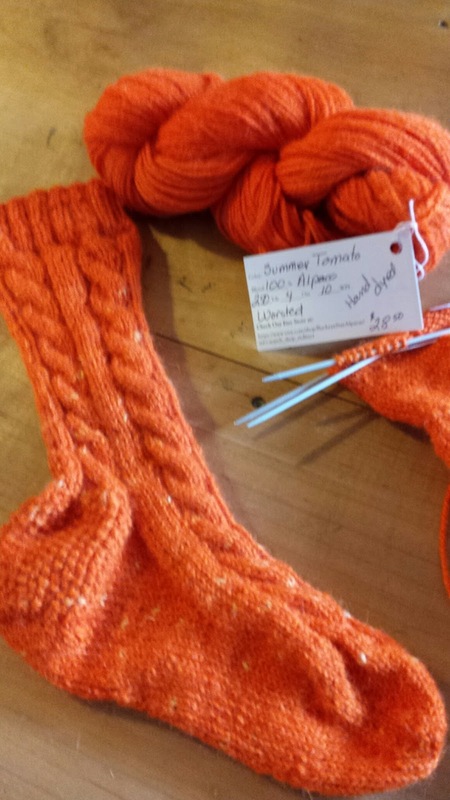 Heaven knows, I have plenty of yarn to work with. Last summer I did a batch of "Fresh Tomato" red-orange yarn that sold well, so I bought some more colors. Dyeing yarn is a fascinating process. 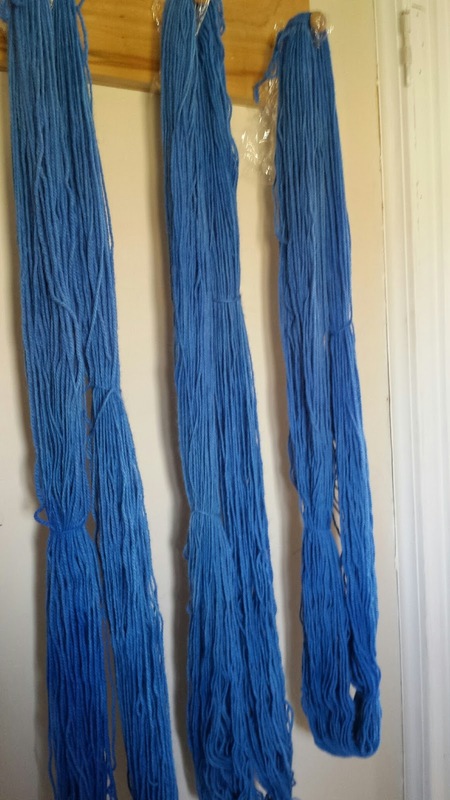 You soak plain white yarn in the sink until it's completely wet and then put it into a pot of water and dye on the stove top (or crockpot) As it comes to a simmer the yarn soaks up the dye from the water. As a final touch, to set the dye and make it colorfast, you just add some plain old white vinegar and simmer a few more minutes. Then, like magic, the remainder of the dye goes into the yarn and the water becomes clear! After it cools I rinse the yarn in the sink again, spin it in my salad spinner to remove the excess water and then put it on a special platform in my high-tech dryer or hang it on a peg in the laundry-room to dry. Today I brewed up a pot of Greener Shades river blue at half strength and came up with a blue that I'm going to call Agean Blue in honor of my Greek heritage. Be sure to come on out to the Seneca County Farmer's Market in Tiffin this Saturday from 9 a.m. until 1 p.m. to see all of my pretty new colors. Prom and graduation season always makes me a little nostalgic. This feeling came on when my first daughter, Amy, graduated from high school and has happened every May since then. I used to sit on my front porch on the evening of graduation (when I didn't have one that I had to attend) sipping wine while I waited for the joyful cacophony of honking car horns as soon as the ceremony was over. It's what they do in a small town. This year the motivation behind my nostalgia is two-fold; my first granddaughter, Olivia, will be graduating from high school and I will be attending my 50th class reunion! I look forward to attending Olivia's graduation. I'll cry. I'm not sure how I'll feel when I attend my class reunion. Both Olivia and her freshman brother, Max, attended prom this year. (One of his track teammate's girlfriend's, best friend, needed a date.) 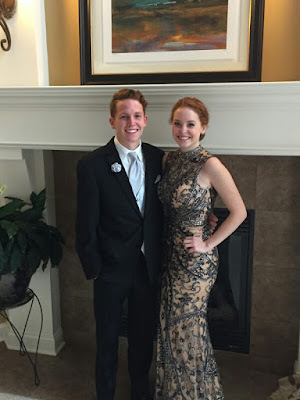 Seeing both of my older grandchildren dressed in formal wear brought tears to my eyes. I thought my own daughters grew up too fast, but grand kids? It's almost inconceivable that the two little redheaded toddlers are going to high school. My youngest granddaughter, Zaidee, who lives clear out in Portland, Oregon, will be turning 12 years-old this year. I'll soon be writing about her prom if the years fly by as swiftly for her as they did for Olivia and Max. 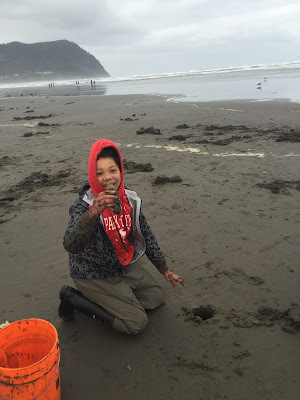 Received this picture of her digging clams on the Oregon coast earlier this week. The last Thursday in April we had shearing at our farm this year instead of hauling animals 12 miles down to a friend's place. After almost five years of owning alpacas we felt that we knew enough to set up a station here. Mary Jane, our shearer, spent the night with us so she could set up the night before, allowing us to begin at 8 a.m. Our friends who live one road over and down four miles brought their three animals down and joined us for the day's work. Myron and Rhonda, who had completed the shearing of their animals earlier in the week came up to help, too. Everyone pitched in heaving animals onto the table, vacuuming them with a shop vac, bagging fleece and sweeping up afterwards. Mary Jane, pushed through until 2 p.m., finishing our six animals before we broke for a pot luck lunch in the store. I had made a crock pot full of sloppy joes, my friend Lisa brought her famous cheesy potatoes and Rhonda brought Rich's favorite Ballreich chips. After lunch Mary Jane finished up the last three animals and was ready to shove off at 6 p.m. for her next stop down near Mansfield. Took may be a bit overweight but not nearly what I had expected before shearing. That's her daughter, Mango, in the background. While we were shearing I gave a call to our vet and ask that he come out to help with two necessary tasks. The first was sad to say the least. I'm sorry to have to report that our herd sire, Nikko, a beautiful animal, had to be put down. He had been becoming more and more aggressive in recent months. It all started last fall when he tried to jump on me. Fortunately, Rich was in the pasture with me and caught him before any real damage was done. Another time he tried it with Rich and was held off. Mocha, who is about 18 months old, is beginning to get his male hormones. This means that when he was near Nikko he often rolled up his tail, an impudent action that males do to assert their masculinity. Nikko often became agitated and aggressively jumped on the fence trying to get at Mocha. The last straw was when Nikko rammed the gate that separated their pastures, broke the latch and got in with the little boys. Fortunately it happened on a Saturday when Rich was home from work. He heard Mocha's screeching and by the time he got to the pasture, Nikko had Mocha by the neck. When Rich, perhaps a bit recklessly, jumped in between to separate them, Nikko bit him on the neck. Between the two of us we managed to get a halter and lead on Nikko and Rich dragged him back into his own pasture where we secured the gate. From that point on I worried whenever Rich had to go into the pasture to refresh his hay and water. We still agonized for the next couple of weeks about whether to put him down or not. The night before shearing, Rich and Brian, our neighbor tried to put a harness on Nikko in preparation for locking him inside so his fleece wouldn't get wet in the rain that was predicted. Rich and Brian are both tall guys and they still had trouble handling Nikko. That's when we knew that he wouldn't get any better and we just couldn't have a violent animal on the farm. So, sadly, the next afternoon, after he was shorn of his gorgeous, soft fleece, Nikko had to be put down. We buried him out under the old oak tree where the sawmill used to stand. The second task that we had for Bob, our vet, was a much happier one. We have been trying to breed our beautiful brown Leezza ever since we got her with no success. She came to us with a free breed back to one of the herd sires at Amy J's Homestead Alpacas and though they tried several times it just didn't take. The next year we tried to breed her to Nikko. It appeared that she had been successfully bred because she passed the "spit" test (see entry for October 24, 2013 for explanation) which is said to be about 80% effective. We waited 11 months and nothing. If she had been pregnant she must have either absorbed or aborted a microscopic fetus. So we tried again with Nikko last fall. She passed that spit test twice. We didn't know whether to be hopeful or not so we waited. When we attempted to clip her toenails one day last winter, the usually biddable Leezza, was a bit testy. She let us do her front nails and then decided that she'd had enough and began bucking and dancing away from us. When Mango was pregnant the first time, her usually laid back nature disappeared and she became a "touch me not" and a bit grumpy, much like some human pregnant women do. When Leezza started exhibiting this behavior we decided that if she was still ouchy in the spring then we would have a blood test done. Dr. Bob called the other day with the best news ever. He is 90% sure that Leezza is pregnant. So now we wait until October with our fingers crossed. Now we can relax until October when we hope all three females will each be delivering a new addition to the herd. There's nothing like watching those new crias pronking around the pasture. It's joy set in motion and one of those everyday things that just make you smile.